This wide-ranging anthology of classic and newly-commissioned essays brings together the major theories of multiculturalism from a multiplicity of philosophical perspectives. The editor is Assistant Professor of Philosophy at Emory University. She teaches courses in ethics, social theory, and contemporary Continental philosophy. Her previous publications include articles in Cultural Critique, Philosophy and Literature, and Research in Phenomenology. She has also published a book, Maternal Ethics and Other Slave Moralities (1995). I Post-Hegelian Dialectics of Recognition and Communication. From Redistribution to Recogntion? Dilemmas of Justice in a "Post-Socialist" Age (Nancy Fraser). Unruly Categories: A Critique of Nancy Fraser’s Dual Systems Theory (Iris Marion Young). A Rejoinder to Iris Young (Nancy Fraser). Recognition, Value, and Equality: A Critique of Charles Taylor’s and Nancy Fraser’s Accounts of Multiculturalism (Lawrence Blum). Ludic, Corporate, and Imperial Multiculturalism of the New World Order (Martin J. Beck Matustik). II Post-Marxism and Issues of Class. Multiculturalism: Consumerist or Transformational? (Bill Martin). Post-Marxist Political Economy and the Culture of the Left (Donald C. Hodges). III Continental and Analytical Feminism. Identity, Difference, and Abjection (Kelly Oliver). Psychological Explanations of Oppression (Ann E. Cudd). IV Corporeal Logic and Sexuate Being. Toward the Domain of Freedom: Interview with Drucilla Cornell by Penny Florence (Drucilla Cornell). Morphing the Body: Irigaray and Butler on Sexual Difference (Tamsin Lorraine). Alienation and the African-American Experience (Howard McGary). "Stuck Inside of Mobile with the Memphis Blues Again": Interculturalism and Conversation of Races (Robert Bernasconi). Fanon and the Subject of Experience (Ronald A. T. Judy). White Studies: The Intellectual Imperialism of US Higher Education (Ward Churchill). Moral Deference (Laurence M. Thomas). "Multiculturalism," Citizenship, Education, and American Liberal Democracy (Lucius Outlaw, Jr.). Ceremony and Rationality in the Haudenosaunee Tradition (Scott L. Pratt). Educational Multiculturalism, Critical Pluralism, and Deep Democracy (Judith M. Green). Universal Human Liberation: Community and Multiculturalism (Leonard Harris). "There is much in this volume that is valuable" The Year's Work in Critical and Cultural Theory (reviewer and date unknown). "This exciting collection of key articles will be very useful for teaching and spans a more comprehensive range of topics than any other collection I've seen." Linda Mart&#237;in Alcoff, Syracuse University. 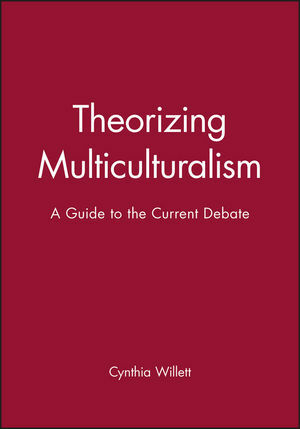 The first critical survey of the key theories of multiculturalism. Combines classic articles, specially revised articles and newly-commissioned essays. Includes an unparalled range of perspectives. Sets the stage for a transformative vision of social change.